Anders Carlson-Wee was a professional rollerblader before he studied wilderness survival and started hopping freight trains to see the country. He is the winner of Ninth Letter's 2014 Poetry Award, New Delta Review's 2014 Editors' Choice Prize, a Dorothy Sargent Rosenberg Poetry Prize, and is a two-time nominee for a Pushcart Prize. His work has appeared in Linebreak, Ninth Letter online, New Delta Review, The Pinch, Best New Poets 2012, and is forthcoming in Ninth Letter and Best New Poets 2014. 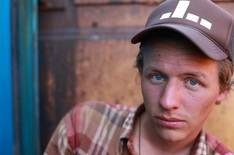 The recipient of scholarships from the Bread Loaf Writers' Conference and the Sewanee Writers' Conference, Anders is currently an MFA candidate in poetry at Vanderbilt University.